Angela Rosser (affectionately known to C3 members as “Anji”) founded the Circle City Chorale in January 2010, and currently serves as our Conductor and Artistic Director. Born in Terra Haute, Indiana, Anji lived all over the country with her family while her father worked for the U.S. Department of Justice as a federal prison warden. She started her music studies at an early age, singing in choirs and playing the piano in elementary school, and continued to pursue choral and musical theatre experience throughout high school and college. 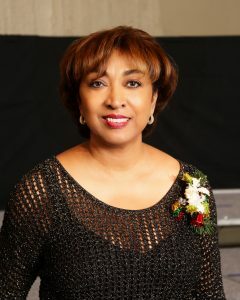 Anji earned a Bachelor of Arts Degree in Music (Performance) from Spelman College in Atlanta, Georgia, where she also served as the Student Director for the Spelman College Glee Club. For more than twenty years, Anji worked for Pacific Bell/AT&T and rose to the position of Regional Sales Director. While at Pac Bell, she formed a corporate choir (The Belltones) that sang throughout California for special events for more than 10 years. Anji also served as Director of Music at the Corona United Methodist Church where she oversaw the vocal and instrumental music programs for nearly 21 years before stepping down in July 2014. After teaching piano and voice part-time for nearly 20 years, Anji started Melody Manor Music LLC, in 2009 and is now a full time music teacher, working with nearly 50 students per week of all ages. She is a member of several professional music associations and her community activities have included serving on the board of directors and as a vocal director and instructor at Christian Arts and Theatre (CAT Corona). Anji and her husband Rufus have two grown daughters, Ashley and Victoria, and have been Corona residents since 1989. We are extremely fortunate to have Angela Rosser as our director! And Anji is thrilled at the opportunity to have this lifelong musical dream become a reality!